If you’re looking for Poker, then you’ve come to the right place. We offer 7 kinds of Poker at River Rock, and have a busy and exciting Poker Room, where you can play Texas Hold’em, or Pot Limit Omaha. Find 3 and 4 card Poker and Texas Hold’em Bonus with the other table games on the main gaming floor. 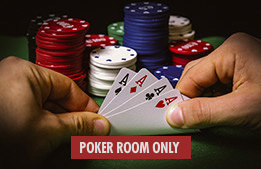 Play your choice of Low Limit to No Limit Texas Hold’em with buy ins starting as low as $30, with all Hold’em games in the poker room qualifying for the Super Bad Beat Jackpot. Staffed by our friendly, and professional team, our Poker Room offers an excellent selection of bar and food service delivered directly to your seat! Not to mention some of the best action in town! The River Rock Poker room is excited to welcome our new partner, The Racebook! Now located in the Poker Room, our 50+ seat Racebook will give all of our guests a chance to enjoy the excitement of off track betting and poker all in the same room! Please be advised that as of January 21st, 2018 the River Rock Casino Resort’s Poker Room will adjust the number of poker tables from 10 to 5 tables and we will also be undergoing some minor renovations to the facilities. Our operating hours will now be 11:00am to 3:00am, seven days a week. Also, please note that we are no longer running tournaments on Saturdays. We look forward to enhancing the overall entertainment experience that we offer to all guests. Thank you for your continued patronage and understanding. Should you have any questions, please do not hesitate to speak to one of our Team Members.